﻿ Meyer Snow Plow Information - All models, pumps, and blades. News, resources, videos, and more! We are open 9 - 5 Monday - Friday Eastern Time. Shop for Meyer Plow Parts now in our Online Store! Removing Terminals from plugs. Installing Terminals in plugs, and crimping on new terminals. Do you want to Mount your Socket? Here are some ideas (over 50 examples). 1-5-19 Meyer Plow Hose Information- Which one do you need? A new product I just invented. Makes mounting your receiver hitch spreader MUCH easier! ONLY 20 in stock, when they are gone that is it! in the PA Rams and hoses, and why, and where it comes from. 2-24-18 Should you worry about lubricating pivot points on your plow? 2-17-18 Can you replace a standard lift model with an H Model? Yes. What you need to know first. 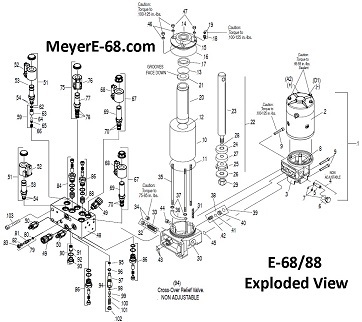 Since the SOS with E-73 Hydraulics is now all Meyer will be offering at this point. One site may forward to the other in the future, but for now, both are up. 2-4-18 VIDEO - Where to add fluid to your Meyer E-60 Quik Lift, how to change the fluid in your Meyer E-60 Quik Lift. 2-1-18 My Meyer Plow Info Checklist - A checklist you can download and use to record the various parts of your plow system. Before you can find the help you are looking for, you NEED to KNOW what you have. 1-11-18 Frozen? - Your Meyer Plow Pump is Frozen? 1-7-18 Frequently Searched Phrases - Dec 2017. Search terms used that brought visitors to this site. Maybe your answer is here? 11-29-17 Checking the Fluid Level in ALL Meyer Plow Pumps - E-46, E-47, E-57, E-60, E-68, E-88, V-70, V-71, E-72, E-73. Where and HOW to check the level. 10-30-17 Meyer Plow Pump Identification Page Updated More pictures of all units to date, and information. 10-4-17 Meyer Standard Operating System information. Also known as the SOS. It is now standard for all Meyer straight plows. Next year, V Plows too. 9-18-17 New Video talking about Meyer E-47 Motor Cap & Brush Kits sold all over the internet. explains why. I should have made this video years ago. Updated 9-6-17 Buying a used Meyer EZ Plus mount plow? Tis the season. 7-31-17 Lifted 2007 Jeep Wrangler JK 3.5" lift, 35" tires, Meyer Drive Pro 6' 8" install. Just because it works does not mean it is 100%. Built for a specific reason for a customer back in 2012. 6-7-17 What is the difference between the Nite Saber II and Nite Saber III plow lights? 5-29-17 2017 Ford F-250 Meyer Lot Pro 7'6"Plow Install. Also, helpful info links to the Ford Body Builder site pertaining to the Superduty trucks. 5-27-17 2017 Ford F-150 Meyer Drive Pro 7'6"Plow Install. Also, general info from Ford on the F-150 and plows. 5-27-17 What is a Meyer E-49? WE built one for sale. to our site for help with their Meyer plow problems. Answers and links to answers provided. 3-26-17 Buying a used Meyer EZ Plus mount plow? 2-24-17 Meyer E-58H Hose Upgrade? Added 1-22-17 What is Mechanical Binding? 10-2-16 Just added Frequently Searched Phrases that brought visitors to our web site. 9-7-16 Just updated the Meyer Plow Controllers page with current info on ALL controllers. 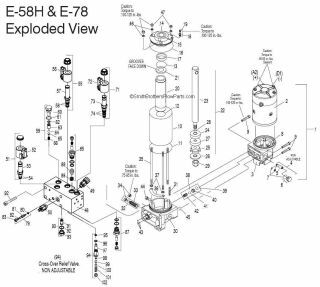 8-26-16 Just updated Home-Plow-by-Meyer.com with parts lists and exploded view diagrams of plows, hydraulics, and wiring. 8-19-16 We built yet another web site dedicated to Meyer Snow Plows. This one is for the Meyer Xpress Plow with E-68 Hydraulic Unit. MeyerPlowHelp.com is our newest site. Hopefully it will be an index of sorts for the info that is spread over all of our Meyer Plow web sites. It will also be a place where visitors can help each other with finding a fix for the particular problem they are having with their Meyer Plow. 3-2-16 Meyer Touchpad Controller Overload Light - Why? 2-14-16 Meyer Plow Pistol Grip Controller Blinking - HELP!!! 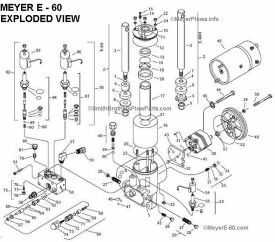 1-10-16 Information on Meyer Plow B and C Valves used on the Meyer E-47, E-57, and E-60 pumps. 10-6-15 Replacing an E-58H or E-72 with an E-47H, E-57H, or E-60H. Now you can have a spare! 12-16-13 Meyer Plow Q & A December 2013 your answer might be here. 12-5-13 Meyer Nite Saber Headlight Adapters - Which one do you need? 7-9-13 Why do people buy snow plows? A focus on personal use snow plows. 3-25-13 Frequently Searched Phrases March 2013 - Answers and links to more info for common Meyer Plow questions. 9-14-12 I made a page for the Jeep Wrangler plows past and present. 5-25-12 Well it has been a long time since we updated. I will fill in some more as time allows. Here is a recent project that is almost done. A 1995 Dodge Ram EZ Classic install, and ST-7.5 plow rebuild. We put this kit together ourselves. 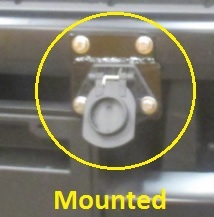 It allows you to install an EZ Classic Mounting Carton from a 1996 - 2006 Jeep Wrangler TJ, on a 2007 & Up Jeep Wrangler JK. Some Genuine Meyer Parts, some we provide in the kit. Meyer does not offer this kit. 12-29-11 We put a Crankstand on a Drive Pro 6'8"
Cracked E-47 Sump Base Castings? Valve Block leaking? Plow won't stay up? 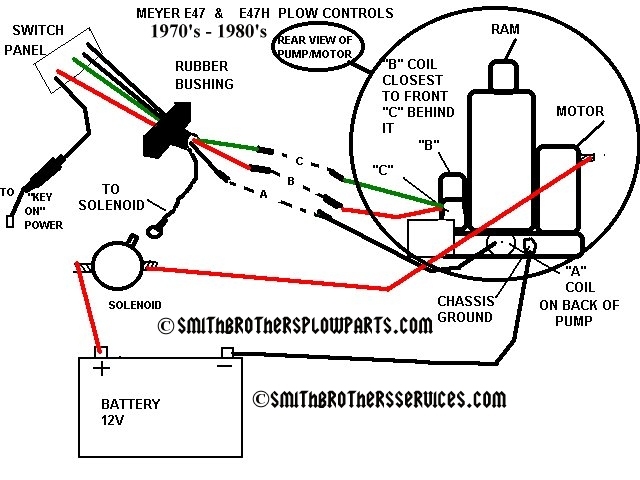 MeyerPathPro.com - The new ATV Plow from Meyer MeyerVPlow.com - Parts Diagrams and Specs for Meyer V Plows. 6-24-11 2011 - 2012 IN Season Plow Pricing is up! 5-3-11 2011 - 2012 Pre-Season SPECIAL Plow Pricing is up! 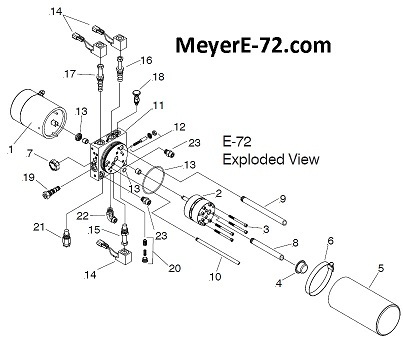 3-12-11 Meyer will be offering the E-72 in the fall of 2011. It is made by Monarch and has a 5 YEAR WARRANTY! 2-22-11 Touchpad Wiring page updated with tech help and pictures. 1-16-11 Meyer Plows Q & A - Your answer may be here. 12-13-10 Some information on Meyer Touchpad wiring. 12-13-10 Some information on Meyer Slik Stik wiring. It's that time of year again. Time to change the fluid in your plow's hydraulic system. Here is a 2 part video we put up on YouTube last year showing how to flush your angle rams. 9-7-10 Meyer EZ Classic A Frame Measurements - Know which one you have? Part Numbers and Dimensions. 9-5-10 Did you know Meyer made a tow behind Drop Spreader years ago? 8-29-10 Did you know Meyer made a Dozer Blade for trucks and tractors years ago? 8-27-10 Meyer Plow Glossary - Lots of historical data here too! 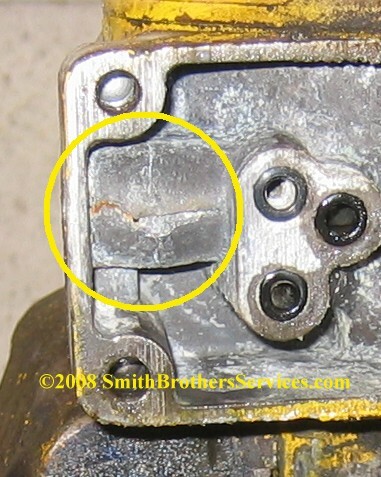 8-23-10 Common problems we find when rebuilding Meyer E-47 pumps. 7-28-10 We added Moldboard Weights to the Meyer plow weights page. The Meyer Payload Dump Insert! Sadly it has been discontinued. 4-8-10 Meyer Plow Install Pics on a variety of vehicles. --Old E-47 Pump, or new style? - Pics to help you! Meyer 75th Anniversary Brochure 1926 - 2001 - A LOT of Historical Information here! --Mount Identification Pictures - What Mount Do You Have? --Can I get an EZ Classic Mount for my...? --Old Meyer Sales Literature - Not just plows! --EZ-Match - Find out what Meyer plows fit your vehicle. --EZ-Transfer - Tells you what you need to transfer a plow from one truck to another. --News - What's new from Meyer. Service Manuals - NEVER PAY for A Manual! They are free on the Meyer Web Site. Forget the slime balls that charge for download links on eBay! You can print your own and put it in a binder. All manuals are in .pdf format. Replaced By the E-68 Pictured Below. Returning in 2010 This is the new Pistol Grip Controller that has replaced the Touchpad as standard. 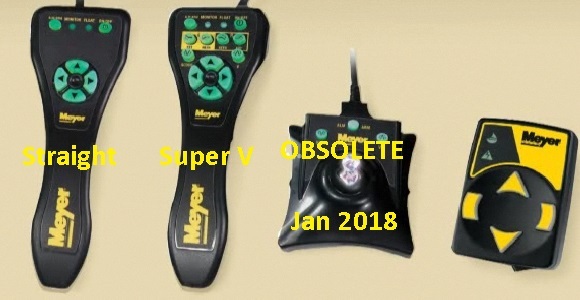 There is another variation of it used with the Xpress plow, and another variation used with the Super V and Super V2 plows. Some popular items from our Online Store! "C" Valve for Meyer E-47, E-57, and E-60 Plow Pumps. MADE IN USA. OEM Meyer Pistol Grip Controller - Includes adapter for touchpad harness (as pictured) and diode for motor solenoid. Orange wire eliminates Nite Saber plow light toggle switch, lights turn on automatically. Left to right - Straight blade Pistol Grip, V Plow Pistol Grip, NEW straight blade Joystick, NEW straight blade Touchpad with built in diagnostics. The Meyer C Series has been discontinued. The Meyer C Series was the Commercial Series of plows. Parts will be available for 10 years. The Meyer C Series plow has been replaced by the Meyer "Lot Pro" Plow Series. The Meyer C Series of plows was often referred to as the "Husky" Series. It had been around since 1969. The C Series is no longer in production. The ST Series has been discontinued. The ST Series was the Standard Series of plows. They were not designed for commercial use. The only ST's left as of last year (2009) were the ST-7.5 and the STL-7.5. The Meyer ST Series has been replaced by the Drive Pro 7' 6", which shares only the name of it's smaller sibling, the Drive Pro 6' 8". It is a totally different design, based on the Lot Pro. Parts will still be available for the Meyer ST Series for the next 10 years through Meyer Products, LLC Authorized Distributors and Dealers. The Drive Pro 7' 6" was renamed the Lot Pro LD in 2014. Same exact design, new name. The Meyer E-46, E-47, E-57, and E-60 have all been DISCONTINUED for over a year now. The replacement for all of these is the E-58H. Parts for the E-47 - E-60 will be available for 10 years from Meyer and I am sure longer than that through aftermarket manufacturers. The Meyer E-88 Hydraulic unit was used on early Xpress Mount plows. It was replaced by the E-68. The E-88 used a wireless controller. Meyer to this day offers a FREE upgrade to E-68 for all ORIGINAL OWNERS of an E-88. 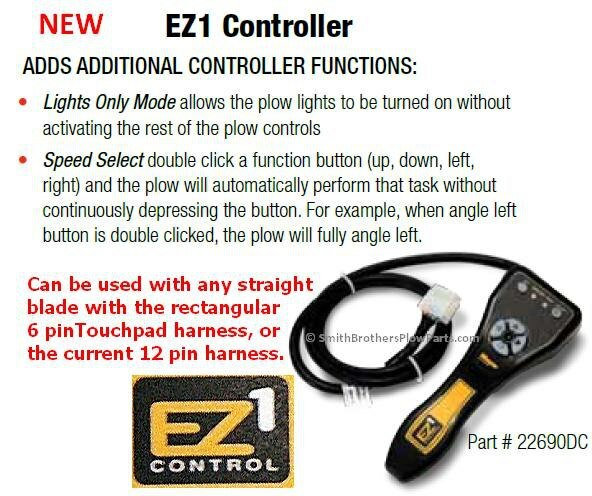 Current production Pistol Grip Controllers have an Automatic Raise and Automatic Lower mode (dubbed Hands Free Plowing). It was only available on the Xpress plows before, but since Meyer went to a standard wiring harness, the wiring just needs to be connected for it to work, providing that the Pistol Grip Controller has the additional ARM/ALM button. The Touchpad Controller has been replaced by the Pistol Grip Controller. Update Jan 2010 - The Touchpad is back, with built in diagnostics like the Pistol Grip has. It CAN NOT be used to replace a NEW plow with a Pistol Grip Controller. There is no adapter from Meyer. We make them. Current production headlight modules have replaceable fuses. Here they are. Current production Meyer Plow Hydraulic Units are now black. No more yellow painted pumps! Here is a pic. Meyer is moving towards using all MONARCH pumps, but as of August 2010 they have not switched, though the V-70 is a Monarch unit, and the E-70 used on the Road Pro is also a Monarch unit. New for 2011 is the E-72, a Monarch unit with a 5 year warranty. In 2014 the E-72 replaced the E-58H as the standard straight plow hydraulic unit. Meyer used to manufacture hard tops for Jeep CJ's. Meyer used to make Rear Plows for Jeeps, Broncos and Scouts. Here is an old postcard, and sales literature showing both. www.SmithBrothersServices.com - Meyer Snow Plow Specialists in Northern New Jersey. We rebuild pumps. We stock and sell new and used Meyer parts. 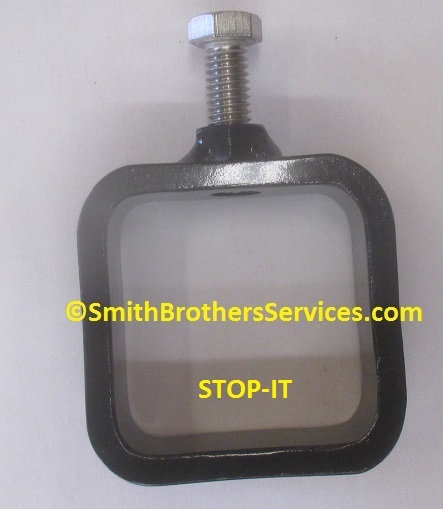 www.SmithBrothersPlowParts.com - The BEST place to get any Meyer Snow Plow Parts you could possibly need, at a good price, with superior service, and free tech help! We have every part that Meyer offers available for purchase, including some obsolete parts. We also carry many aftermarket snow plow parts. We ship smaller parts US Priority Mail so you save on shipping, plus get your parts fast, and larger heavier parts via UPS. The nice thing about US Priority Mail is they deliver on Saturdays at no extra cost to you. MeyerPlowHelp.com - Discussion Forums for those who own and operate Meyer Snow Plows. www.Snowplowing-Contractors.com - Educational Resources for Snow & Ice Professionals, including a Directory of Snow Plowing Contractors from all over the US and Canada. HUGE Meyer Plow Tech area. Celebrating our 10th Anniversary this year! www.ChucksChevyTruckPages.com - EXCELLENT resource for info and tech/specs on 73 - 87 Chevy and GMC pickups, Blazers, Jimmy, and Suburbans. Online since 1998 currently celebrating our 12 year anniversary! www.PlowPump.info - Technical help and resources for all plow pumps here. We will add more as time allows. MeyerST.com - Moldboard Part Diagrams. Sector and A Frame part Diagrams. They can be ordered from Smith Brothers Services. 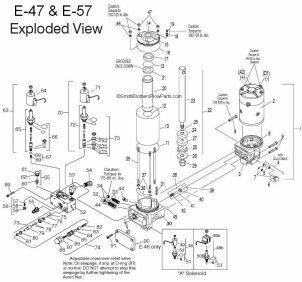 MeyerE-47.com - Exploded views, info and parts lists for E-47 units, including all common variations over the years. MeyerE-57.com - Exploded views, info and parts lists for E-57 units. MeyerE-58H.com - Exploded views, info and parts lists for E-58H units. MeyerE-60.com - Exploded views, info and parts lists for E-60 units, including all common variations. MeyerDrivePro.com - Information on the Meyer Drive Pro. Including the Drive Pro 6'8" that is perfect for Jeeps, Tacomas, and other small vehicles, and the larger Drive Pro '6" that is for 1/2 ton trucks. MeyerLotPro.com - This is the current commercial plow line from Meyer. The Lot Pro is available in sizes from 7.5 - 10 feet wide. MeyerRoadPro.com - The Road Pro replaced the HM and Aggressor Series. Home-Plow-By-Meyer.com - All NEW (July 2010) plow built by Meyer for homeowner use. Fits any vehicle with a front receiver hitch! Shipped right to your door. Common Misspellings: Meyers, Mayer, Mayers, Myer, Myers, Maier, Maiers, Meijer.